All swimming pools eventually develop cracks or leaks after years of use no matter how well they were originally installed or regularly maintained. If your fiberglass pool or spa is starting to show its age and you’re thinking of getting a replacement, think again; you have options. At Texas Fiberglass Pools Inc. we’re experts at turning your aging pool into a backyard centerpiece. With fiberglass repair and remodeling, your pool will be extremely durable and will have lower regular maintenance costs compared to other materials. If you’re in Tyler, Texas, look to Texas Fiberglass Pools Inc. for expert repair and remodeling of your swimming pool that’s also fast, efficient and competitively priced. Do You Need Fiberglass Pool Resurfacing in Tyler, TX? Most fiberglass pools can last anywhere from 20 to 40 years after which the surface might start getting chips, cracks or blisters. Spas and fountains too can develop surface cracks. Most of the time surface cracks can be fixed by a patch, saving you money and time. However, sometimes you might want to consider having your fiberglass pool, spa, fountain or baptistery resurfaced to bring it back to its original condition or better. If you’re already seeing signs of damage in the form of cracks, blisters or anything else that’s out of the ordinary, then it’s probably time to call a specialist. Don’t delay; little cracks can grow in size and cause much bigger problems that are always more expensive and take more time to fix. Hiring an expert today will save you money in the long run. Turn to the experts at Texas Fiberglass Pools Inc. to find out more about fiberglass pool resurfacing. Maybe you got your house renovated and now you feel like your swimming pool just doesn’t cut it anymore. Or perhaps you changed your backyard a little or got some landscaping done and your pool just doesn’t do justice to the entire yard. Remodeling a swimming is pool is complex job. You could try doing it yourself but it’s usually not worth the risk of having something break down in the near future costing you even more money. Instead, hire professionals with years of experience in the field of fiberglass swimming pool remodeling and repair. If you have gunite pool, you should consider getting it remodeled with fiberglass, which is more durable and costs less in the long run. The maintenance costs of keeping fiberglass in perfect condition are much lower than any other material. You have to choose who remodels your pool carefully. At Texas Fiberglass Pools Inc. we focus only on fiberglass pool repair and renovation and we offer one of the longest warranties in the business. Do You Need Pool Leak Detection in Tyler, TX? It’s not always easy to detect leaks if you don’t have a trained eye but one simple way is to take notice of the water levels. If you have to add more than two inches of water every week, then you probably have a leak. Any pool can develop problems after years of use, and even though fiberglass pools are very durable, there might be cases when you need to have someone take a look at it, especially if you’re not sure if there’s a leak. A pool leak can cause a number of problems including lifting the fiberglass shell from the ground due to water seeping in between the shell and the ground. You can avoid such problems by quickly calling a pool leak detection expert in Tyler if you notice any signs of a leak. When you suspect you might have an issue and need pool leak detection in Tyler, you don’t have to look far; there is a team of experts right in your neighborhood. At Texas Fiberglass Pools Inc. we have the expertise to get to the source of your problems fast. Call us today for a risk-free, no-cost consultation and estimate. There is no one better at finding and repairing pool cracks than the expert team at Texas Fiberglass Pools Inc. With over two decades of experience, we’ve handled every type of pool repair imaginable. If your pool is showing signs of cracks, don’t waste time because small fissures left unattended can grow in size and become more expensive to repair. One call to us and we can usually be there within days, finding and repairing any cracks your pool, spa or baptistery has. There are so many reasons to get cracks promptly repaired. While some issues like spider cracks don’t pose a structural threat, they’re not attractive and you may want to repair them for aesthetic reasons alone. If you have a crack that leaks, however, that has to be attended to immediately. Leaking in a fiberglass pool can cause the shell to rise from the ground due to water build up. No matter what the reason, don’t put off having your fiberglass pool repaired; small repairs can escalate into large jobs quickly. At the first sign of leaking, pick up your phone and call the pool repair specialists at Texas Fiberglass Pools Inc. We offer a complete package of repair and remodeling services that will bring back the shine and glory of your pool. You deserve an exquisite-looking swimming pool or hot tub made with the best quality materials. Are You Looking For Pool Plumbing Repair in Tyler? Swimming pools, spas, waterfalls, fountains and other outdoor water features are beautiful to look at and a pleasure to use but behind the scenes they’re a lot more complex than they appear. Even if they’re flowing just fine, there might be an underlying issue that you might not be able to see. This is especially true for older fiberglass swimming pools or features or those that were not maintained properly. If you are in Tyler, Texas and looking for a pool plumbing repair or just need someone to take a look at something that’s not working as well as it should, contact Texas Fiberglass Pools Inc. Our team of professionals will look at your swimming pool, fountain or spa, and and fix any plumbing problems. We even handle baptisteries and commercial pools. Gunite pools eventually develop leaks and those leaks can be very elusive to find even for seasoned professionals in the industry. If you’re not sure if you have a leak, a simple way to check is to keep an eye on your water levels. Having to add water every week is a good indication there is a leak. It’s not a good idea to delay or postpone getting your gunite pool repaired as it can lead to a number of other problems. 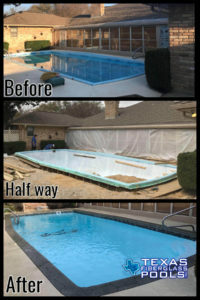 Call Texas Fiberglass Pools Inc. and get the issue fixed sooner than later. Using a number of methods, including a computerized analysis of your water loss, our leak detection experts will assess the rate that water is leaving your pool, taking into account normal evaporation. -Appearance. If stains grow in size or quantity, or if repeated attempts to clean up and remove your stains are unsuccessful, it’s time to resurface your pool. -Touch. If the surface feels rougher on your feet than you think it should or if the gunite is beginning to show through, it’s time to resurface your gunite pool. Your first instinct might be to resurface your gunite pool with plaster, marcite or a quartz aggregate but we strongly recommend fiberglass for a longer-lasting, lower-maintenance and overall more beautiful finish. In the long run, you’ll save money with fiberglass. Fiberglass is easier to take care of than a concrete pool, it requires less long-term maintenance and uses less energy and chemicals. The fiberglass gelcoat surface is smooth, too, unlike abrasive plaster or the exposed aggregate of a concrete pool interior finish. Here are some more reasons why we recommend resurfacing your gunite pool with fiberglass. -Fiberglass is attractive. It’s available in a wide range of colors, including white, blue, blue-green and more. -It’s extremely durable and outlasts every other pool material. -Fiberglass pool resurfacing comes with an extensive warranty. -Resurfacing a concrete pool with fiberglass takes less than a month. Through the years, your baptistery gets a lot of wear and tear and can develop leaks, cracks, stains and other damage. If any of these issues are noticeable, it’s probably time to get your baptistery resurfaced or repaired. The professionals at Texas Fiberglass Pools Inc. will make your baptistery perform and look like new again. We will assess all issues and eliminate any problems while being fast and efficient. Fiberglass has numerous advantages over other materials and is easier to keep clean and maintain. It also provides for a more beautiful, lustrous finish. If your baptistery needs repair or resurfacing, call us today for a free estimate. We promise to bring new life to your baptistery and make it look better that it ever has. Flagstone is arguably the best type of stone anyone can use for their patio, walkway, or pool deck. Available in a large number of colors and textures, we can create your ideal Tyler, Texas backyard using the right flagstone patio design. The trained craftsmen at Texas Fiberglass Pools Inc. will work with you to come up with a scheme that complements what you already have in place. Texas Fiberglass Pools Inc. has the expertise and creative insight to make your patio or pool deck look great and complement your house and backyard. We provide our customers with a wide range of customization and freedom with a long list of different colors and textures. At Texas Fiberglass Pools Inc. we are focused on one thing: your complete satisfaction. We are the industry experts in Tyler when it comes to fiberglass pool repair and remodeling and handle all types of leak detection, crack repairs and resurfacing for homes and businesses. We can turn your aging fiberglass, concrete or vinyl pool into the pool you’ve always wanted. Call Texas Fiberglass Pools Inc. at (972) 301-8142 and schedule a free estimate to renew, restore, and resurface your outdoor oasis.